Fluid is delivered to the tissues by blood circulation system (arteries). This protein-rich fluid goes into our cells and in the spaces between our cells. Most of the fluid is returned back by the blood circulation system (veins) but a small amount is returned by a system of small channels called the lymphatic system. So one of the main functions of the lymphatic system is to serve as an auxilliary system to return fluid back to the heart. If a patient has a malfunctioning lymphatic system, then fluid accumulates and swelling will occur. The protein-rich fluid component of blood is called plasma. About 20 liters of plasma are delivered to our tissues per day. About 17 liters of fluid filters back into the blood circulation system and is returned by the venous system, but the remaining 3 liters is return by the lymphatic system. This lymphatic fluid return is not only important for overall fluid balance. It is also important because the lymphatic fluid collects “invaders” (like bacteria, viruses, cancer cells), and waste products. The lymph fluid in your legs travels up small lymphatic channels that is filtered through lymph nodes. 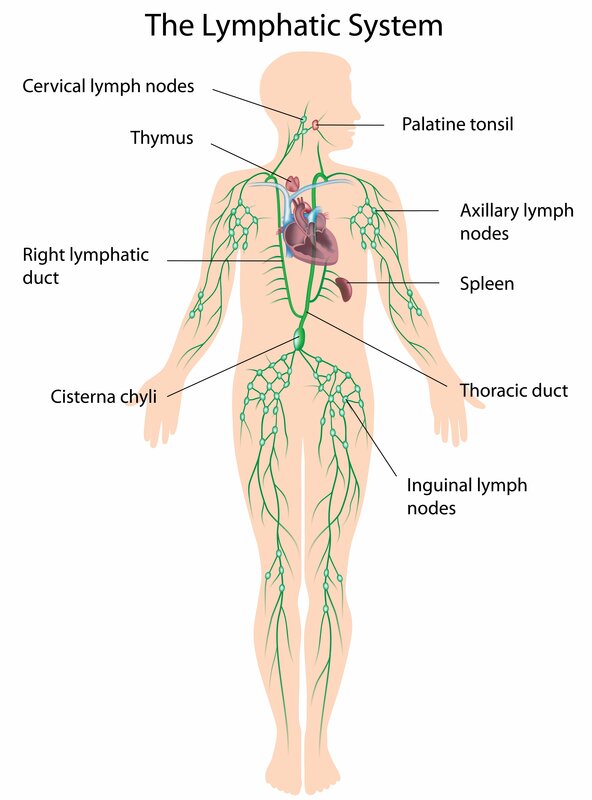 Inside the lymph nodes are infection fighting cells known as monocytes and lymphocytes. These cells are responsible for recognizing the invaders. The monocytes basically “chew-up” the invaders and the lymphocytes produce antibodies that become attached to foreign objects and help the body eliminate them. Cancer cells can also collect in the lymph nodes. This is why lymph nodes can become swollen with an infection or with various types of cancer. Incidentally, the lymphatic system of the digestive system is responsible for absorbing the fat in our diet. In patient with venous insufficiency and normal lymphatic systems, we see an increased volume of flow through the lymphatic system to help get fluid back to the heart. Conversely, patients who mild lymphedema may have worse swelling if they also have venous insufficiency because the subpar lymphatic system cannot take up the extra fluid the venous insufficiency causes. Lymphedema is the abnormal collection of high-protein fluid just beneath the skin. This swelling, or edema, occurs most commonly in the arm or leg, but it also may occur in other parts of the body. damage to the lymphatic system by infection. surgical removal of lymph nodes (usually in cancer operations). congenital malformations or absence of the lymphatic vessels. This is called primary lymphedema. In developed countries like America, the most common cause of lymphedema is surgical intervention for cancer. In developing countries, the most common cause of lymphedema is infection. The main symptom of lymphedema is swelling. The swelling can range from mild to severe. Associated symptoms include a feeling of heaviness, feeling of tightness in the skin and diminished flexibility of the joints. Lymphedema is a progressive disease so symptoms should not be ignored. While lymphedema cannot be cured, it can be treated and the earlier it is treated the easier it can be managed. There are 4 stages of lymphedema, ranked by severity of swelling. Stage 0 (latent): no swelling may be visible, but patients may experience a feeling of heaviness and fullness. Stage 1 (spontaneously reversible): This is when most patients start to be concerned. They will notice swelling that gets worse during the day and goes away spontaneously overnight or during other periods after they lie horizontally for a few hours. The swelling is compressible (pitting edema): pushing with a finger on the swollen area will leave an indentation. Stage 2 (spontaneously irreversible): at this point, the swelling no longer goes away by simply elevating the legs. Most patients notice that swelling doesn’t go away overnight anymore. The tissue has a spongy consistency and the swelling no longer “pits”: the swollen tissue simply bounces back when pressed by a finger and no indentation of the tissue is left behind. This is a result of fibrosis: scar tissue being laid down. At this point, only compression therapy or lymphedema massage can reduce the swelling. Stage 3 (lymphostatic elephantiasis): At this stage, the swelling is irreversible and usually the limb(s) or affected area is noticeably large. The skin is very hard and even high compression and massage won’t reverse the swelling. Fluid may leak from the skin, blisters may form, and recurrent infections may occur. Usually the diagnosis of lymphedema is made clinically by the physician. Unfortunately, most patients present with Stage 2 lymphedema, so the typical patient presents with moderate to severe non-pitting edema that does not go away over night. 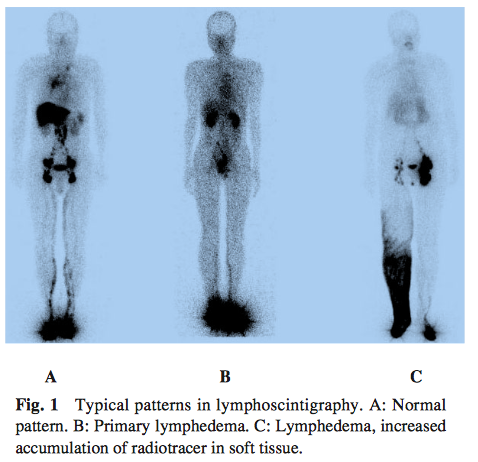 The most specific exam to diagnose lymphedema commonly employed is a lymphoscintogram. This is nuclear medicine study used in which radioactive particles of protein are injected just under the skin of the area of the body to be imaged. For the leg, the site of injection is usually between the toes. Most often both lower extremities are injected so the uptake in one leg can be compared with the other. Lymphedema is characterized by slow or no uptake. In the normal pattern A, one can see ample amounts of tracer going up the leg with good accumulation in the groin (inguinal) lymph nodes. In the primary lymphedema pattern B, large amount of tracer remains in the feet, very little tracer is seen in the leg, and there is hardly any groin lymph node accumulation. In pattern C, this is a patient with right lower extremity lymphedema. Notice the thick leg, filled with tracer, and much less tarcer accumulation in the right groin lymph nodes compared to the left. Lipedema is very similar to lymphedema, However lipedema is caused by an abnormal accumulation of fat cells in the lower extremities, usually extending from the hip to the ankles and sparing the feet. It is also symmetrical, it never just affects one limb. It is also characterized by easy bruising and painful to touch. This condition is found exclusively in women. Lipedma is often confused as lymphedema. As time goes on and as lipedema increases, the limbs often develop lymphedema. Then the picture can become even more confusing when lymphedema develops in a limb or limbs with lipedema. Skin not painful (unless secondary infection is present) Skin usually sensitive or painful to touch. Can occur in men and women. Almost exclusively occurs in women. The Alaska Vein Clinic does not treat lipedema. The only way to effectively re-contour the body is through surgical techniques such as liposuction and reductive surgery. These procedures are usually performed by plastic and reconstruction surgeons. Click here to download a Comprehensive Guide to Lipedema. (These videos are made by Osmosis and are made available via Creative Commons).